Chocolate Brownies – The perfect farewell gift? While I may not have had the best experience, I have been lucky to work with some very, very talented people from whom I have learned a lot. As a thank you for their contribution to my learning, I decided to make some brownies. They seem to be universal favorites and are quite easy to make. The only thing you need to be careful about is not to over bake them – if you do, they will be quite dry and rubbery. This recipe makes ridiculously gooey, rich, decadent brownies! It’s so quick, its bad because you will want to keep making some! 😀 I added some chocolate chunks, but I think that put them totally over the top. 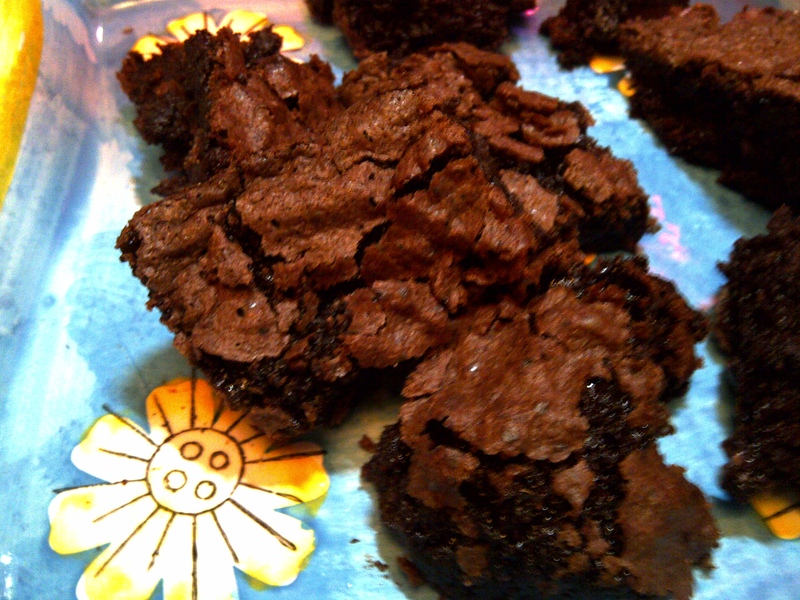 The next time I bake these, I am going to omit the extra cup of chocolate chunks. These brownies were a hit and I am glad I ended things with everyone on a sweet note. Pre-heat oven to 190 degrees Centigrade or 375 degrees Fahrenheit. In a heavy saucepan, bring butter, sugar and water to a boil while stirring constantly. Remove from the heat. Stir in about 2 cups of chocolate chips/chunks until melted. Set aside and allow to cool slightly. Once the chocolate-butter mixture has cooled down, beat in the vanilla to the mix. In a separate bowl, beat the eggs will. Gradually add the chocolate mixture to the eggs, mixing well. Fold in the flour, baking soda and salt and the remaining one cup of chocolate chips/chunks. Pour the prepared mixture into the prepared pan and bake for 20-25 minutes. If you insert a knife, it may not come out clean, but the brownies are done when the top is glossy and slightly cracked. Brownies cook even after you take them out of the oven, so be careful not to over bake! These are extremely rich brownies and fudgey brownies! Perfect for a chocolate lover. I also use another brownie recipe which is more cakey and less dense than this one for some friends who prefer a less chocolate rich version. I will be baking those soon and will post the recipe!